The party was on a Friday night, and, coincidentally, one where our entire office had to go to San Rafael for the day. So I couldn’t even come home early to prepare; I had to do everything the night before. I shopped at four stores. I stayed up until midnight sautéing, chopping, plating, and otherwise preparing all the stuff for the following day. And, since I am indeed apparently a crazy person, I wanted to have more than just cheese, bread, and veggies for appetizers, so I opted to make a few more things. I searched the internet for appetizer recipes and arrived easily at Martha Stewart’s website. I have mixed feeling about the old gal since her whole bout with insider trading, but no one can deny her success. 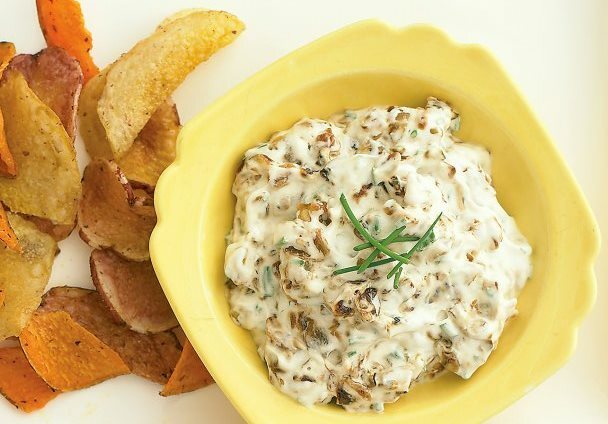 Her site was helpful, and this recipe for Sweet Onion Dip turned out to be a hit. I will plagiarize blatantly (below), but do see her website for more appetizers and for more info. In a large skillet, heat oil over medium. Add onions; season with salt and pepper. Cook, stirring frequently, until golden brown, 12 to 15 minutes**. Let cool to room temperature. *Or, as many chives as you damn well please. **She says 12-15 minutes. This took me almost an hour for whatever reason. They wouldn’t brown! I should have cooked them on higher temp probably, but didn’t want to accidentally burn them.